“If I hadn’t been sitting in the room then I would not have made that connection.” – Carolyn Sheridan, clinical director of the AgriSafe Network referring to her experience at the May 2015 Annual Forum. AgriSafe, the University of Wisconsin-Eau Claire’s College of Nursing and Health Sciences and the Southern Minnesota Center of Agriculture partnered with UMASH to plan and host the forum. The focus was “Growing Agricultural Education: Embracing Health and Safety”. Fifty-five attendees from a variety of backgrounds including healthcare, occupational health and safety, education, research, government, media, communications, immigrant services and human resources participated. The interactive format provided attendees many opportunities to network and partnerships to blossom. Following the forum, these partnerships continued to grow. Ms. Sheridan of AgriSafe, Brad Schloesser, Dean of Southern Minnesota Center of Agriculture and faculty member at South Central College, and Megan Roberts, faculty member at South Central College, connected at the Annual Forum and soon after partnered to bring a Personal Protective Equipment (PPE) training to students in the agribusiness program at South Central College. The training reached nearly 100 students including one nursing student who was interested in learning about PPE related to agriculture. Mr. Schloesser hopes to see more collaboration between nursing programs and agriculture health and safety efforts. 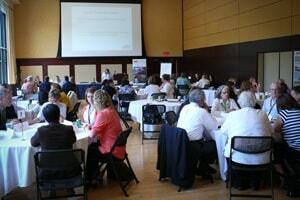 Forum organizers agreed that the planning process was valuable for forming relationships between the organizations and learning about each other’s work in the field. Ms. Sheridan connected with Jeff Bender, UMASH Co-Director, to co-teach “Minimizing Transmission of Infectious Diseases during Outbreaks: Public Health Protection for You and Your Workforce”, at the University of Minnesota’s Summer Public Health Institute this May. She said she had known of Dr. Bender previously, but planning the forum together gave them the opportunity to work together. This event is an example of how UMASH is actively living out our vision “to connect people and organizations to identify needs, challenges, and opportunities in agricultural health and safety”.